SNES Donkey Kong Country (USA v1.0) in 25:19.07 by alex_penev. 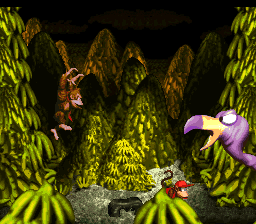 Fast completion of Donkey Kong Country without bothering to find out all the secrets and stuff. 14 seconds faster than the previous version by Alexis Neuhaus. The in-game time is 22 minutes and 18.8 seconds (shown as 0:22 because the game doesn't display seconds, but it still keeps track of them internally). We recommend reading the rest of author's comments too.